How frequency products complement forward thinking design within new applications and facilitate development of future technologies. Frequency products have historically rarely been the highest priority for a design engineer or indeed for a purchaser. And yet as RF integration becomes ever-more prevalent within both consumer and industrial applications, the frequency components that are responsible for the quality of communication within these devices are fast becoming urgently important. These days it's likely a designer will need to check the limit of the frequency technology they want to use before they begin laying out boards, and at Golledge it's a personal mission to roll back those limitations as far as we can. The technology we can offer is developing fast, and with each new design it gets even better. Our new-design product presentation makes it easy to compare frequency product recommendations for cutting edge designs. Including clock crystals and oscillators, high frequency components and frequency products for special applications, find out how your project can benefit from our range. It’s a classic problem; you’re designing for an application that calls for both high frequency, with either MHz or GHz output, but also low phase noise at these frequencies to ensure signal fidelity. We often get asked for frequency components that can fulfil both of these strict criteria, particularly for applications such as transmitter design where engineers really need the ability to reach the higher frequencies without compromising their design by building in extra noise. In these instances we would always recommend wherever possible using a fundamental mode crystal or an oscillator that incorporates a fundamental mode crystal and working to minimise the amount of PLL multiplication needed. Recent developments in inverted mesa technology mean it’s now possible to offer engineers our GSX-328, a fundamental crystal available up to 315MHz that can be used to create frequency sources with very low phase noise. For engineers who want a complete oscillator solution our GXO-3306 is formed of a fundamental crystal with in-built exceptionally low noise IC, meaning excellent jitter performance for audio applications. The brilliant thing about both of these products is the size, with footprints of only 2.5x2.0mm and 3.2x2.5mm, these miniature packages mean you don’t need to compromise on board space to achieve top-drawer functionality. 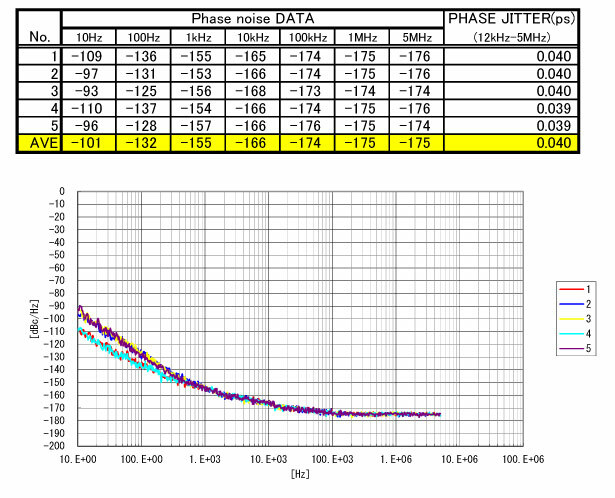 Phase noise plot of the GXO-3306 showing excellent phase noise floor of -175dBc/Hz @ 1MHz and jitter performance of 0.04ps typical (12kHz ~ 5.0MHz). There are two camps when it comes to real time clock (RTC) applications: those engineers that develop their own solution and only require a 32.768kHz crystal such as our GSX-315 to power it, and those who would prefer to design in an all-in-one solution and save themselves time through avoiding matching, reducing the size of BoM, and reducing assembly costs. At Golledge we are more than happy to cater for both solutions and we therefore offer the best in RTC module technology to make sure our engineers aren’t left with a one-sided choice. Through our partnership with Microcrystal we are able to offer both the world’s smallest package RTC modules, available at sizes as small as a 3.2x1.5mm footprint, and also the world’s lowest power, with power supply options available in uncompensated modules as low as 17nA offered by the RV-1805-C3. If the engineer wants to go further and also request temperature compensation as part of the module then we can still offer extremely low power specifications. The RV-8803-C7 combines temperature compensation with a supply current requirement of only 240nA, the smallest package size, and a wide range of additional functionality including clock and calendar, temperature sensing, alarm and timer, and control flag functions. An RTC may not be appropriate for all situations but we do know that by combining so much functionality within one small package, engineers who do choose the all-in-one option are left with more time to refine the rest of their design and channel their creativity into developing methods of achieving cutting-edge technology. 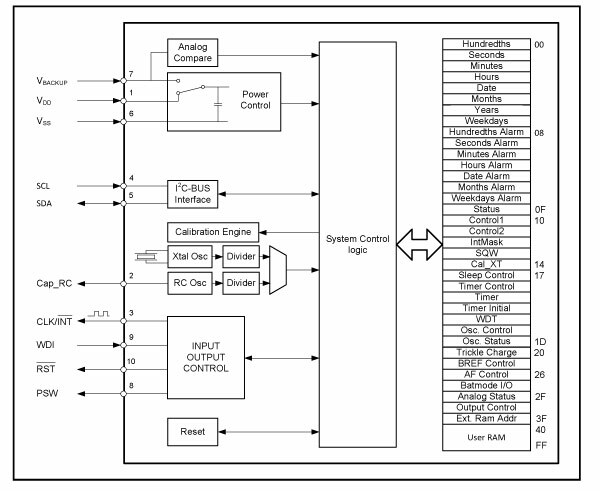 The block diagram of the RV-1805-C3 shows the additional functionality available to the engineer when selecting to use a low power all-in-one solution over an in-house timing solution. Todays technology is quickly expanding into more and more extreme environments where components need to withstand not only extremely high temperatures but also very high levels of shock and vibration, often at the same time. Down hole is the classic example of the type of application that needs these types of components, however we also see enquiries for smart city-based technology such as railway balise. The latest developments in mounting and glue technology make a real difference when offering components for use within these environments. For example, the CC6A-T1AH 3.5x2.2mm surface mount crystal for extreme environments functions perfectly over an operating temperature range of -55 to +200ºC, and can withstand shock of up to 10,000g and vibration measurements of 40g rms 10.0 ~ 2,000Hz. It is the special mounting mechanisms used within the CC6A-T1AH and other extreme components which minimises the stress placed on the crystal blank within the package, even under extreme conditions. 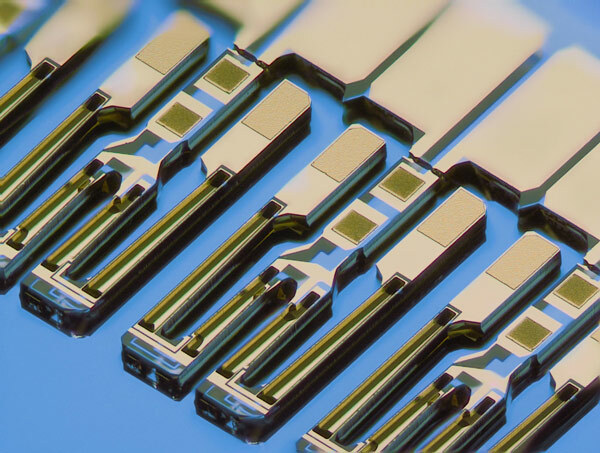 Miniaturization has been a long running trend within the frequency market, as it has within the majority of technology markets for many years now, with suppliers beginning to offer quartz components within ultra-miniature 1.2x1.0mm packages. There are many challenges to overcome when creating crystal components at this level of miniaturization caused by reducing the size of the physical crystal blank. These include an increase in motional resistance, decrease in Q, and an increase in the minimum attainable frequency. The mounting technology within the package must also be updated to ensure optimum crystal performance and reliability within the small package. Our GSX-211 ultra-miniature 1.6x1.2mm package (for high frequencies) and the even smaller CM9V watch crystal with 1.6x1.0mm package crystal both offer cutting edge miniaturization, ideal for new designs within applications such as wearables. At the other end of the size spectrum lies the HCD660, one of the oven controlled oscillators (OCXOs) we offer as a solution when precision is paramount to a design. Particularly favoured by base station designers, the HCD660 offers exceptionally tight temperature stabilities of <1ppb peak-to-peak and aging characteristics of <0.2ppb peak-to-peak per day. Components within these types of projects need to be able to be designed in and then remain stable for years to come with minimal engineering interference. By providing such an exceptional level of long-term stability our OCXOs allow design engineers to build products that will last for generations. Sometimes it’s not enough to just be ultra-miniature or ultra-precise, sometimes your design will need both and that’s an area we’re working on helping to reduce the level of compromise required by the engineer when meeting these demands. The GTXO-203 is one of our flagship products for providing high stability within a miniature space, offering exceptional stabilities as good as ±0.5ppm, within an ultra-miniature 2.0x1.6mm package. Filtering is an integral part of the frequency market and two of the major areas we supply are crystal filters and SAW filters. At the lower end of the frequency spectrum, crystal filters offer the engineer powerful filtering capabilities within miniature packages. In particular our GSF-75, a four pole filter, something which would normally be split over two separate packages, is encased within one miniature surface mount package, providing a large amount of space saving for the engineer during board layout and a simpler manufacturing process. At the higher end of the frequency spectrum we offer one of the world’s largest available range of SAW filters and resonators and our in-house SAW frequency experts are often asked for advice on design-ins. Our stock ranges from highly competitive commercial parts priced to ensure minimum budget impact, through to tiny 1.1x0.9mm surface mount components with built in balun functionality. One further noteworthy development within the SAW area is the fusion of SAW filters with low noise amplifiers to produce front end modules. These are highly suitable for use as an all-in-one solution, particularly within the automotive industry, and are available with AEC-Q200 qualification as standard.